Thanks for this graph, Tony!. It just goes to show just how dangerous the stuff that we work with really is. 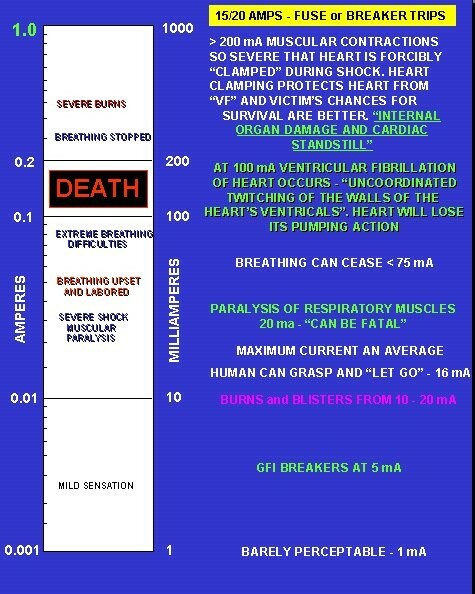 10mA is not a lot of current really, but look what it can do to the human body!. And of course, if you have damp hands, chances are, you'll let more current than that pass through your body. Also, with the passage of current through human muscles and organs, the thing you have to think about is internal tissue damage, which is usually "par for the course" when a reasonably large current (in mA) passes through the body. And that's regardless of what it can do to your heart, as well!.